The first American casualties in the conflict with Japan fell not at Pearl Harbor in 1941, but in China in 1937. The American sailors had just finished eating their Sunday dinner and were relaxing aboard their ship. Out of earshot, Japanese bombers and fighters roared through a clear December sky. Even as the warplanes closed in, the sailors remained unaware of them. The attack was a complete surprise. Bombs and bullets rained down on the unprepared seaman, dealing out death and destruction. The first shots of the Pacific war had been fired, but not at Pearl Harbor, and not in 1941. It was Sunday, December 12, 1937, the setting was the Yangtze River in China, and the sailors were the crew of the gunboat USS Panay. Though the attack was sudden, a violent meeting between Americans and Japanese had been a long time coming—a seemingly inevitable consequence of decades of foreign policy in Asia. And though the attack on the Panay was quickly forgotten, it was a warning of things to come four years later at Pearl Harbor. The Panay was part of the century-old Yangtze River Patrol, a legacy of the tense political situation in China. In the mid-1800s, the United States, France, Britain, and Russia earned the right through treaty to patrol Chinese rivers. The Yangtze River Patrol was the US naval presence on China’s waterways. Its original mission was simply to fly the US flag and support US consular officers. Over time, that mission evolved into protecting American business interests and missionaries in China. The number of patrols fluctuated in the latter half of the century, and as the 1800s gave way to the 1900s, France, Germany, Austria-Hungary, Russia, Japan, and Britain all maintained gunboats in Chinese rivers along with the United States. After the Boxer Rebellion—a major turn-of-the-century uprising against growing Western interests in China—the US Navy organized a base for the Yangtze River Patrol, first at Shanghai and later at Hankow. Operations became highly organized and routine. Deep inside Chinese territory, the patrol fought pirates and bandits, escorted American merchant ships, occasionally sent parties ashore to guard American citizens, and otherwise protected American interests. After America entered World War I, the navy began coordinating river patrol operations with the British Royal Navy, a practice that continued after the war. The Yangtze River Patrol originally was outfitted with converted yachts and former Spanish gunboats captured in the Philippines during the Spanish-American War. Eventually, the Panay, Guam, Luzon, Tutuila, and Oahu replaced the antiquated recycled fleet. Like her sister ship the Oahu, the Panay was designed with a flat bottom and low draft, specifically for use on the shallow Yangtze. Launched on November 10, 1926, she was 191 feet long with a top speed of 15 knots. She was armed with two 3-inch guns and eight .30-caliber Lewis anti-aircraft machine guns, four on each side. With twin smoke stacks amidships, the upper deck resembled the verandah of an Oriental hotel. Below, the quarters were light, airy, and unusually comfortable for such a small ship. By this time Lieutenant Commander James Joseph Hughes had taken command of the Panay. Born in New York in 1898, Hughes was a 38-year-old graduate of the US Naval Academy who looked like a businessman. He had received command of the Panay only in June 1936, and it was his first, though he had been involved with the Yangtze River Patrol for years. Hughes had four officers working under him on the Panay. His right-hand man was Arthur “Tex” Ferdinant Anders, a dependable executive officer who had been on the river 18 months and had worked his way up through the ranks to earn a promotion to lieutenant soon after Hughes took command. Next were Lieutenant Clark Gilson Grazier, a dark-haired and handsome medical officer, and Lieutenant Junior Grade John W. Geist. Both came from Pennsylvania. The youngest officer on board was Lieutenant Junior Grade Denis Harry Biwerse, a 25-year-old Wisconsinite who was assigned to the USS Asheville, but was filling in on the Panay until a replacement arrived from the states. There were 49 American crewmen, a cross section of Depression-era America. Some were there for adventure, some because they could not find work, and others because the sea and service offered them a chance to become men. Rounding out the ship’s roster were eight hired Chinese workers and four Chinese enlistees in the US Navy who served as mess attendants. These men did most of the hard work on board and waited on the others. As Japanese forces drove deep into China during the summer of 1937, heading for the nation’s capitol, Nanking, foreign powers began to send in reinforcements. Soon 9,000 Western troops and sailors—mostly British, American, and French—were stationed in Shanghai, and the Yangtze filled with warships from their countries. The Yangtze River Patrol was stretched all along the river. The Oahu, Tulsa, and Sacramento operated around Shanghai, while the flagship Isabel roamed everywhere. The Panay patrolled far upstream. In mid-September, US Ambassador Nelson T. Johnson moved onto the USS Luzon and conducted embassy business afloat. By early November, the Japanese had Nanking nearly surrounded, and its defenses were stretched to the breaking point. Asiatic Fleet headquarters posted the Panay at the city, 225 miles from the coast, in an area where the Japanese were conducting air raids. The ship became a refuge and sanctuary for neutral nationals. American and European businessmen and embassy officials took advantage of the safety aboard the gunboat when necessary. Extraordinary precautions were taken to ensure that both sides could identify the Panay as American. Two 5-by-9-foot flags were lashed to the awnings on the fore and aft decks. In addition, the so-called Sunday flag, the ship’s largest at 6 by 11 feet, was flown every day. At night, the flags flew under spotlights. Further precautions included informing the Japanese army headquarters in China whenever the ship moved or anchored. This was done through diplomatic channels by Ambassador Joseph Grew in Tokyo and by the American embassy staff in China. The Japanese command in China was a combined army-navy structure. Vice Admiral Kiyoshi Hasegawa, commander of the Japanese Third Fleet, was the supreme commander of all Japanese naval forces in the region, and the supreme army commander was General Iwane Matsui. They attempted to coordinate their maneuvers. The Japanese army and navy each had its own air force. Naval air units in China fell under the control of Rear Admiral Teizo Mitsunami of the 2nd Combined Air Group, headquartered in Shanghai. Mitsunami’s command comprised the 12th Air Group, based at Changchow, and the 13th Air Group, based at Shanghai. Each of those two groups had a fighter, a bomber, and a dive-bomber squadron. In November, the Americans realized the situation in China was becoming dangerous to civilians, and Asiatic Fleet headquarters ordered families of military personnel out of Nanking. Hughes’s and Anders’s wives moved out of harm’s way to Canton. On the 27th, Chinese Nationalist leader Chiang Kai-shek’s government informed the American embassy that it must evacuate Nanking, so Johnson and most of the embassy staff departed for Hankow the next day on the Luzon. A few staffers headed by second secretary George Atcheson, Jr., stayed behind to safeguard the 20 or 30 citizens who remained. 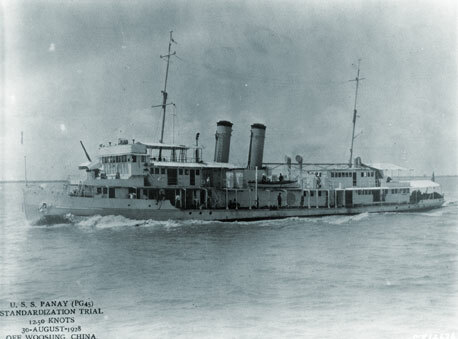 The Panay was assigned to guard the remaining Americans and take them to safety at the last possible moment. Within a week the situation in the city was so dangerous that the skeleton embassy staff boarded the Panay. Atcheson, who had been serving in China since 1927, led the delegation on board. At his side were second secretary J. Hall Paxton, who had served in Nanking since 1927, and Captain Frank Roberts of the army, an assistant military attaché. Along with the embassy delegation, neutral nationals also sought shelter on the gunboat. Among them were Italian war correspondent Sandro Sandri, London Times Far East correspondent Colin McDonald, Colliers’ correspondent James Marshall, Eric Mayell of Fox Movietone News, and Universal Newsreel cameraman Norman Alley. Also hitching a ride to safety were some international businessmen, including F. Hayden Vines, an American employee of the British-American Tobacco Company. From Tokyo on December 1, Ambassador Grew informed the Japanese government that the Panay, along with three Standard Oil tankers, would move upriver on the 11th. Hasegawa, at Japanese Third Fleet headquarters, also got the word. Four new Japanese group commanders arrived at Shanghai on December 4, among them Lieutenant Masatake Okumiya, who had served in China since 1933. In command of a dive bomber squadron of the 13th Air Group, Okumiya immediately participated in daily missions around Nanking and along the Yangtze. Although he had been flying since 1933, this was his first combat command. On Saturday, December 11, the Panay escorted the tankers Mei Ping, Mei An, and Mei Hsia to just above Nanking. Despite advance warning of the movement, Japanese artillery units opened fire on the ships at 2 p.m. Incredibly, all 40 or 50 shells missed the targets. Hughes decided to move the small flotilla out of harm’s way and shifted the anchorage to 12 miles above Nanking for the night. The new position was passed along to the Japanese. The next morning, shelling began again, and Hughes decided to move farther upstream. He requested that Japanese army headquarters be notified about Panay’s movement and mission. At 8:25 a.m., the gunboat raised anchor and headed upstream followed by the tankers. Around 9:30, a Japanese army unit signaled the Panay to stop. Fifteen minutes later a Japanese lieutenant and six armed soldiers came aboard. Hughes and Roberts met the boarding party. “The Japanese were intentionally rude, insolent, and high-handed,” Roberts recalled. Hughes ignored the insults, explaining, “I had special orders from the Commander Yangtze Patrol not to be too sensitive about points of naval etiquette when dealing with the Japanese military—and above all else, to use my judgment in avoiding such complications as might arise.” After some perfunctory questions, and confirming this was indeed an American vessel, the Japanese left, and the ships got under way again. Around 11 a.m., the Panay convoy dropped anchor at a spot some 27 miles above Nanking known as Hohsien Cutoff, where the river was about a mile wide with marshes on both sides. The convoy dropped anchor in 45 feet of water with the Mei Hsia above the gunboat, the Mei An astern, and the Mei Ping alongside to exchange guests. Atcheson radioed the ship’s location to Shanghai and Hankow and requested that the information be passed along to the Japanese. The crew and passengers began the traditional navy Sunday meal around noon. At the same time the ships dropped anchor, Okumiya returned from a bombing mission to land at the 12th Air Group’s base at Changchow. He finally ended up at naval headquarters, where he learned that several enemy merchant ships loaded with Chinese troops were attempting to escape from Nanking. This intelligence was based on a fabricated report from the army unit that had boarded the Panay that morning. The army requested that the naval air force launch a strike against the ships. By this time, Atcheson’s report on the Panay’s position had reached Third Fleet headquarters, but was not relayed to the 2nd Combined Air Group and its commander, Mitsunami. The transmission of the report was delayed because it did not pinpoint the precise location of the Panay and the tankers. The commanders of the Japanese strike force, which consisted of nine Type-95 fighters and six Type-94 dive bombers from the 12th Air Group and three Type-96 bombers and six Type-96 dive bombers from the 13th Air Group, were briefed. Okumiya commanded the 13th’s six dive bombers. The American crewmen were relaxing after their meal when the ship lookout reported to Hughes at 1:36 p.m. that he saw 12 to 15 planes flying upriver. Hughes hustled to the bridge to grab his binoculars. Just as he put them to his eyes, he saw the Japanese biplanes tip into dives. “That Sunday on the Panay we had just had our chicken dinner,” Anders recalled decades later. “We heard Japanese heavy bombers coming. It wasn’t a new sound. They were hitting the Chinese ashore. The Japanese hadn’t struck us. America was neutral. The three heavies came at us. And they were followed by six dive bombers.” As Hughes watched through his binoculars, Chief Quartermaster John H. Lang saw it all with the naked eye. “They’re letting go bombs,” Lang screamed; “get under cover.” As the crew scattered, tobacco merchant Vines, on the Mei An, wrote that he could not believe the Japanese were attacking. “The ships were clustered together with U.S. flags everywhere,” he wrote. Hughes and Lang ducked back into the pilot house just as the first bomb struck at 1:38 p.m. “It seemed to hit directly overhead,” Hughes remembered. Lieutenant Biwerse had stepped out onto the forward port deck and was hit by the explosion. He was dazed and sat on the deck with his uniform completely blown off except for his shirt. The bomb caused massive damage to the Panay, knocking out the 3-inch bow gun, wrecking the pilot house, destroying the radio equipment, toppling the main mast, rupturing the main fuel line, damaging the sick bay, puncturing the fire room, and severely wounding Hughes and several crewmen. “Even though we weren’t moving,” wrote Lieutenant Geist, “it was a good shot for a bomber.” And this bomb had come from the high-flying planes. The dive bombers had not yet struck. Hughes had a fractured leg and was taken to the galley for protection. Anders assumed command, despite the fact that he was wounded in both hands. The ship and crew were fighting for survival now as the high-level bombers turned away. “I could see three heavy bombers going back down river,” Geist recalled. The Japanese dive bombers screamed down at their targets, with Okumiya’s squadron heading toward the tankers. “The rest of us came diving in,” Okumiya wrote. “My dive brought me down to 1000 meters. My vision was completely filled with the ever-growing target on the yellow surface of the water. At 500 meters I released the bomb and pulled out of the dive. While climbing I looked back and was surprised to see a large water ring. My bomb had missed! My surprise was doubled upon observing misses by the rest of my squadron.” The other dive bomber squadron followed. One of its bombs went through the wardroom of the Mei An, killing the captain and everyone else in the room. All the bombers then turned back to base, and only the fighters remained. The fighters knocked Geist down. Even from his prone position, he could see the enemy clearly. “They came in low enough for us to see the red suns on their wings distinctly and we could see the pilots of some of the planes,” he recalled. “Even in the excitement, they would have to see our flags.” The shrapnel from the near misses had found more of the crew. Anders was hit in the throat and was unable to speak commands. He continued to exercise command by writing down orders. Geist, though wounded, vocalized the written instructions. The wounded were moved to the steel-plated boiler room. The crew members had practiced the drill many times during their tour in war-torn China. They began to place the wounded on the two small boats, but because there were so many, several trips were required. Fortunately, there was a lull in the bombing. Several crewmen gave up their lifejackets to civilians. Lieutenant Grazier—the Panay’s medical officer—raided the sick bay, salvaging health records and collecting dressings, drugs, and antiseptic. Biwerse destroyed confidential publications, sank the code book, gathered clothes and blankets, collected rations and fresh eggs, and took a Lewis machine gun and ammunition. He also released the steam in the boilers to avoid an explosion when the cold river water hit the engine room. The process of shuttling passengers and crew between the shore and the gunboat seemed too slow to Roberts. He thought he might swim to shore, but after looking at the 900-yard stretch of water between him and land, he realized, “I’ll never make it.” Just as the lifeboats began their second trip, the Japanese fighters struck. They strafed the gunboat, the tankers, and the men in the water. Meanwhile, Colliers’ writer Marshall had jumped from the Panay’s stern to the Mei An’s top deck rather than wait for a spot aboard a lifeboat. On the Mei An, he was hit by gunfire in the neck, shoulder, and chest. Despite his wounds, he made it ashore safely with the crew of the Mei An as she sank. When the Japanese focused their attention on the other two tankers, the captains ran those ships aground on the shoreline. On the Panay, newsman Sandri was hit. The lifeboats continued to shuttle back and forth—and the fighters attacked them. “Japanese planes strafed the boats on their way to the shore,” Atcheson would report in a court of inquiry. McDonald’s account in the Times continued that line of thought: “The strafing seemed like the end of a deliberate systematic attempt to destroy the gunboat and all who had been on board.” The gunfire hit two of the wounded men in McDonald’s boat. At 3:05 p.m. the last men aboard the Panay—Anders, Biwerse, Wisler, Lang, and a few others—stepped onto the lifeboats. The two boats ran the gauntlet of the fighters as they made their way to shore. The crew and passengers gathered in the high reeds of the marshes. Hughes took stock. All his line officers were wounded except for Biwerse, but he was in shock. Casualties amounted to 15 men in stretchers and 14 walking wounded. The survivors had nothing except the items Grazier and Biwerse had saved. Hughes asked Roberts, the only unwounded officer, to take active command. Before the group could move, a new threat appeared. Two Japanese army motorboats moved into the river. Hughes ordered Paxton of the embassy staff to go ahead on foot to get word to Johnson at Hankow. The main group attempted to slip into the marsh and avoid detection and destruction by the Japanese soldiers. The motorboats approached the Panay first. They machine-gunned the ship, and sent soldiers aboard for a quick search. When they discovered no one on board, they left. They then fired their machine guns through the marshes along the river bank. Finally the motorboats headed upriver. Although the survivors were safe for the moment, they planned to move out soon. At 3:54 p.m. two muffled explosions came from inside the ship, and the USS Panay slipped underwater. Cameras recorded the final plunge. Hughes hoped he and the others could survive until help arrived or they made it safely to a Chinese-held city. American headquarters suspected something was amiss. “The attack on Panay interrupted her radio transmissions in mid-message to headquarters, Yangtze Patrol, in Shanghai,” author Edwin Hoyt explains in his 1976 book The Lonely Ships. “Two hours later [3:38 p.m.] the flagship Augusta queried Yangtze Patrol for news of the gunboat.” The Panay’s whereabouts remained a mystery until a phone call came late that night to the river patrol headquarters from Paxton, at Hohsien, eight miles from where the Panay had sunk. Admiral Harry Yarnell, commander of the Asiatic Fleet, was aboard the USS Augusta at Shanghai. He requested assistance from the Royal Navy, which had the only friendly ships in the area. On December 15 the USS Oahu and HMS Ladybird picked up the Panay’s survivors and carried them to safety. Two American sailors had been fatally wounded in the Japanese attack. Charles L. Ensminger, ship’s cook first class, had died two days earlier, and Edgar C. Hulsebus, coxswain, from Canton, Missouri, would die in the hospital on December 19. They were the first two casualties of the Pacific war. On December 20, the Japanese government admitted its army strafed the Panay and then strafed its survivors, though it maintained that the attack was unintentional. In a brilliant stroke of public relations maneuvering, its formal apology reached President Franklin D. Roosevelt on Christmas Eve. Grew was ecstatic with the Japanese apology and the American response. “Equally masterly was the Japanese arrangement that the note should arrive Christmas Eve,” he wrote in his diary on December 26. “The Japanese could hardly have failed to realize that the Christmas spirit is strong in our country and that the thought ‘Peace on earth goodwill towards men’ must inevitably color and influence our decision. I was so profoundly happy at the outcome that when I called on the Foreign Minister I entered his room wreathed in smiles and told him I brought good news.” The good news was that Roosevelt fully accepted the Japanese apology and the offer of reparations. There would be no retribution. At a cabinet meeting on New Year’s Day 1938, Roosevelt announced his decision. Sixteen weeks later, on April 22, a check in the amount of $2,214,007.36 quietly arrived in Washington from the Japanese government. Of course, the détente proved temporary. Just four years later, the Japanese would attack Pearl Harbor and start a fight that would not be so easily forgotten. James I. Marino is a freelance writer who lives in Hackettstown, New York. This article originally appeared in the February 2006 issue of America in WWII. Order a copy of this issue now. Photo: The deck of the gunboat Panay resembled an Oriental hotel at the time of this trial run in August 1928.